The Fab Four: Happy Golden Birthday Bry! Today is September 26 and my greatest hunk of burning love Bryan turned 26 years old. :) It's funny to think that I can remember Bryan when he was only 15 years old!! Crazy. I've heard the story about 20 times about the day that he was born. Well all I remember is that his mom was canning peaches and talking to her neighbor by the fence. She had to give labor naturally to Bryan. He only weighed 5 lbs. and I think 11 ounces. The umbilical cord was wrapped around his neck. I know that he was born in Provo and he was named "Bryan Scott Call" we was orginally supposed to be called "Scott" since his dad's name is Bryan also. But after Kindergarten after he heard all of the other kids being called by their first names he wanted to be called by his first name too. It would be weird to think of Bryan as "Scott". Anyway, Another random thing is ever since we have been married we have had a birthday in a different house. When he turned 24 we were living in Rexburg going to school, then 25 was at our little apt. in Holladay, and then now here he is 26 and we are living in Tooele! Well, I will add pictures later. 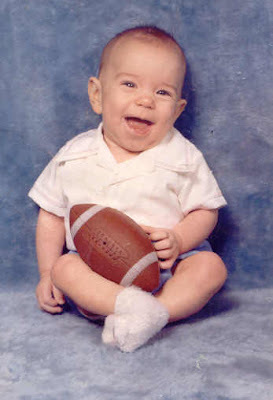 Here is a cute pic of Bry when he was baby! Happy Happy Birthday Bryan Dear! Hope he felt celebrated! How fun! Blaine's birthday was Sept 23 and I believe his mom was also canning peaches when she went into labor! Ben's birthday was the 18th and I would have given anything to be in Utah canning peaches. THe only thing they grow enough of to can here are peppers. . . salsa anyone?